Rock & Roll Woods is a children’s animal picture book written by Sherry Howard and illustrated by Anika A. Wolf. Kuda loved waking up to the everyday sounds of the woods where he lived. If he listened carefully, he could hear the birds singing and the musical little stream near his home. He could hear insects humming, and it often seemed as though the whole forest was alive with tiny sounds. When he set out for his daily walk, however, his peaceful mood was shattered by a loud thumping noise. The noise kept on happening, and Kuda wasn’t sure what to do about it. He saw his friend, Rabbit, who announced that there were new neighbors in the woods. Rabbit seemed to be tapping his foot as he spoke. As Kuda was catching his fish for breakfast, he wondered about his friend, who seemed to be hopping around and actually enjoying the racket. In fact, everyone Kuda spoke to actually liked the booming noises that were echoing through the woods. Kuda went back home and tried to hide under layers of clothes and bedding, but he could still hear the noise. Maybe he’d have to check it out for himself. 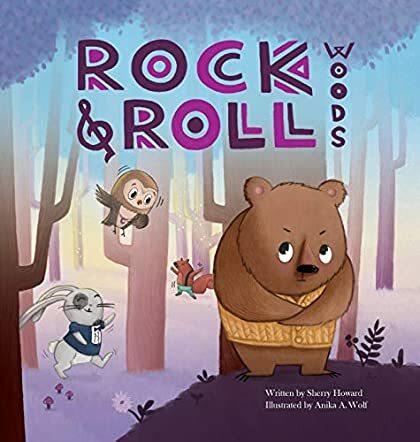 Rock & Roll Woods is an entertaining fable about a young bear and his problem with the changes that seemed to have happened overnight in his neighborhood. Howard’s tale helps kids realize that strange and unfamiliar things might not be nearly as bad or scary as they may seem at first. It also illustrates how differently people may react to sound and stimuli. Howard, a Special Ed Administrator and former teacher, provides information in the back of the book about Sensory Integration Issues that may cause kids to react poorly to loud noises or changes from the norm. Children on the autism spectrum also may have similar issues. She offers suggestions for children and caregivers to consider, using Kuda’s friends and their patience with him as role models for supporting kids they know who may have trouble adapting. Anika Wolf’s illustrations are marvelous! I especially loved the facial expressions she gives to Kuda and his friends, and her ingenious use of colors makes the story seem both enthusiastic and soothing. Rock & Roll Woods is most highly recommended.